Story arc time! We’re going to see just how far Locke’s Team Fortress induced nightmares are pushing his sanity. Exciting! It’s rare that all the main characters are in the same comic together. Doesn’t happen very often for some reason. 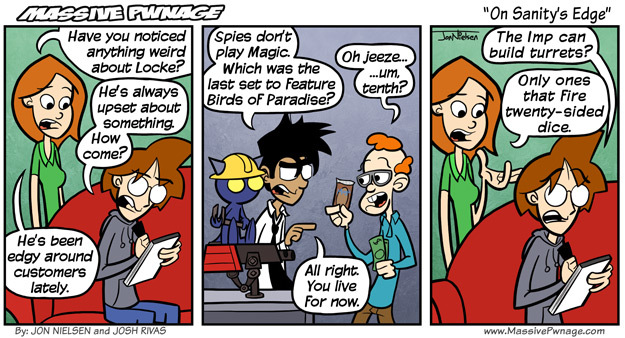 I really like that random guy buying Magic cards. He’s funny. This entry was posted on Friday, July 3rd, 2009 at 12:00 am and is filed under Comics. You can follow any responses to this entry through the RSS 2.0 feed. Both comments and pings are currently closed. Hmm… Dice turret… I like the idea… now if i possessed the knowledge to build it i would. Or maybe i’ll try to capture my own Lesser Demon. Either way challenging. great comic guys! Hahaha I love twenty-headed dice! They’re so awesome! Btw, somehow i didnt knew there was a card named birds of paradise in the tenth edition. And i’ve been playing magic since eight!